Dashboard Little Demon Devil dancer is solar powered, so he wiggle dances in realistic bobbling motion in any bright UV light or sunlight. Solar dancing Lil’ Devil features a classic blood red body, wielding two tiny pitchforks in his devilish claws. Once you hit the lights these little demons spring into action! Just expose the solar strip to bright UV sun light, and watch as his head and arms provide you with your own personal bobbing dance on demand. *Just add your own adhesive base (*adhesive NOT included) and he'll be perfect for any dashboard. Fun Valentine’s Day party favors and team gifts, cake toppers, or display on table, desk top, fireplace mantle, window ledge… anywhere you need a touch of mischief! 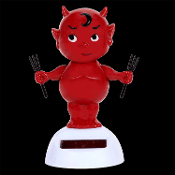 Celebrate the spirit of Halloween with the Solar Power Motion Lil Devil Toy. Just place this mischievous demon in the sun and he will do his hellish dance just for you. Pour a hellishly powerful potion, add costume horns and a tail, and go anywhere Hades style with this cute solar powered toy! Solar Dancing Devil is approx. 4-inch tall x 2-inch wide (at widest point) x 2.5-inch deep, hard plastic with red and black painted details on a white solar powered base. Runs on UV or sunlight via the solar cell on the upper front of the base.